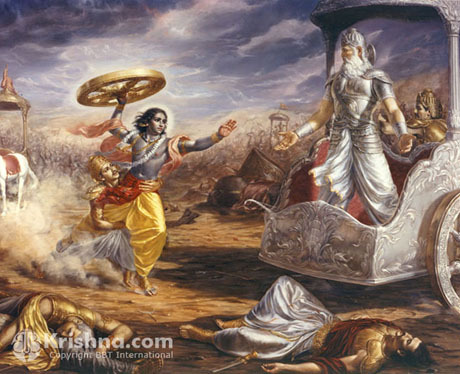 On the ninth day of Mahabharata war, Duryodhana approached Bhishma in his camp. He was suspicious of the grandsire’s dedication to the fight. Duryodana felt that Bhishma was not doing his best , as he was carried away by his affection to the Pandavas. Duryodhana felt anxious of the result if Bhishma continued to fight half-heartedly. So Duryodhana wanted to rouse Bhishma to his full fury, even if it meant hurting the old man. Approaching Bhishma, Duryodhana remarked that Bhishma was waging a half-hearted fight. Stung by these remarks, Bhishma gave word that he would rout the Pandava army and kill all the Pandavas. When Draupadi heard this, she was afraid. She prayed to her Lord Krishna. As soon as she thought of Krishna, he appeared before her. Krishna asked her to follow him. He took her through the battlefield. The battlefield was an awful sight with bodies scattered everywhere. They finally reached a tent. Druapadi got up asking Bhishma to promise protection to her husbands. Thus succeeding in their mission, Krishna and Draupadi took leave of Bhishma. As soon as devotee think of Krishna he appear on lotus of his hearth. When invited by devotee Krishna is always ready to help although apparently we do not see his help. By pleasing great personalities we get blessings even without asking for them as Draupadi get blessings of Pitamaha Bhishma. moral / instructive stories they hear so that everyone can be benefitted.